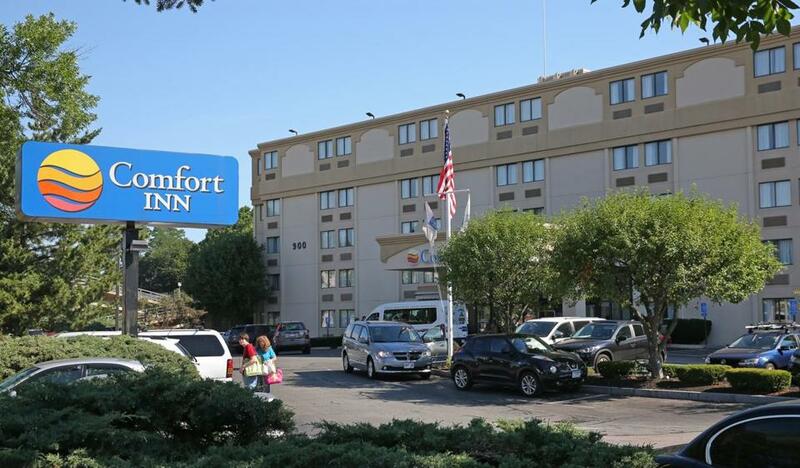 A room at the Comfort Inn in Dorchester, which overlooks a Jiffy Lube and a Dunkin’ Donuts, will cost you about $279 per weekend night this month. Looking for a hotel room in Boston in early August for out-of-town guests? Prepare for sticker shock. And that’s if you can get a room at all. Just a handful cost less than $300 a night, and not by much — from the bare-bones Hotel Boston, formerly a Best Western in Brighton, to the Comfort Inn overlooking a Jiffy Lube in Dorchester. Both cost about $279 for a weekend night in early August. Long gone. Statistics show the average price for a room in Boston is approaching New York rates and rising. Manhattan prices, by contrast, have fallen in recent years. While city leaders frequently talk about Boston’s hotel shortage and the high price of real estate, the problem reaches its boiling point in summer, when more than 90 percent of the city’s rooms are rented, inhabited by a convergence of business travelers and crowds of tourists who arrive in the modest-size city and drive demand through the roof. If you want a room for less than $300, you’ll have to go at least 5 to 10 miles outside of downtown Boston, with most of the affordable stock at places like the Red Roof Inn Plus in Saugus and the Quality Inn in Revere. 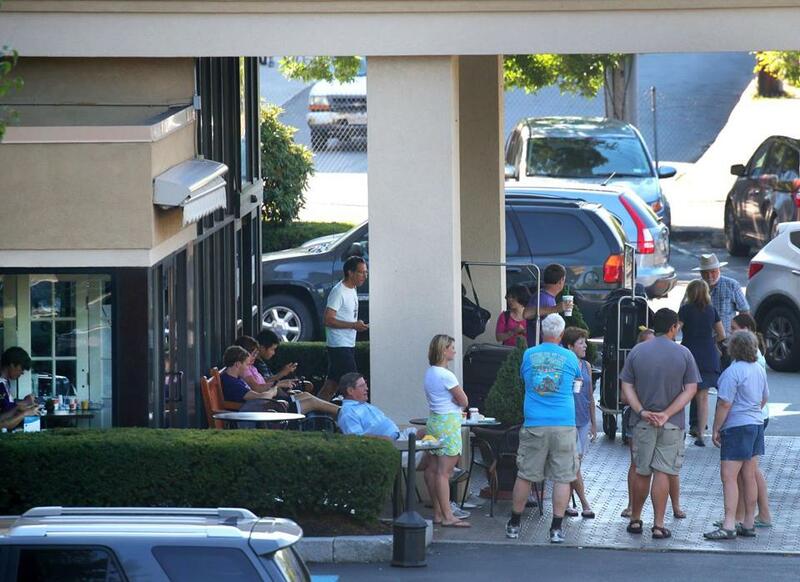 On a recent weekday morning, guests at the Comfort Inn in Dorchester crowded near the parking lot, sipping coffee and waiting for a van to shuttle them to a nearby MBTA station. A few feet away, Bruno Fournier, his wife, and 15-year-old son, from Quebec city, packed their SUV on their way to Maine after two days of sightseeing and a Red Sox game. They got lucky, paying $225 a night, and said they were pleased to see the room was clean, but had hoped for a more central location. “The price is why we’re staying only two nights instead of three,” Fournier said. Prices hit an all-time high last year, when the average daily rate for Boston and Cambridge hotels reached $254, up from $190 in 2010, said Sebastian J. Colella, vice president of Pinnacle Advisory Group in Boston. By contrast, the average daily rate in New York, where many new hotels have opened in recent years, declined last year to $293 a night, just $39 more than in Boston. The average rate nationwide in 2015 was less than half that, at $120 a night. Indeed, $254 a night might seem like a steal compared to a $2,000 a night at Boston’s Mandarin Oriental or a $755 room at the Four Seasons on Boylston Street in early August. But for that price, a person gets turn-down service, espresso machines, and a gander at the hotel’s art collection. Guests waited under cover for a shuttle in the early morning at the Comfort Inn on Morrissey Boulevard in Dorchester. Patrick B. Moscaritolo, chief executive at the Greater Boston Convention & Visitors Bureau, attributes the brunt of the problem to Boston’s small size and high cost of real estate. He is among the public officials advocating for construction of a hotel with more than 1,000 rooms to primarily serve convention-goers. Smaller and more affordably priced hotels, he said, have been built primarily on the edges of the city, in places like East Boston and Chelsea, which he applauds. Chad Sorenson, managing director at CHMWarnick, a hotel advisory firm in Beverly, said Boston is routinely a top US market for hotels, ranking in the top five behind New York and Waikiki in the first six months of this year. A milder winter may have caused hotel business this year to decelerate a bit from 2015, when a record-breaking winter extended the stay of many business travelers who were trapped in the city. Even so, Boston routinely remains a high-priced market. Amelia Sugerman, spokeswoman for Collette tours, said the Pawtucket, R.I., company gets questions about Boston’s high prices, and she wonders what the tipping point is for consumers. When a 10-day tour of New England costs $2,000 but an extra post-trip stay at the Boston Sheraton adds $350 to $400 to the bill, people question it, she said. “I see it as a problem if it continues to escalate,” she said. Pricing, of course, can be more topsy-turvy than New England weather. A couple from South Carolina got a room at the Dorchester Comfort Inn for $159 a night with no-refund reservations made in advance and preferred customer status. Best Western Plus Roundhouse Suites in Boston, on Massachusetts Avenue near a scrap metal yard, has been offering rooms for about $200 a night and drawing many tourists. Massimo Valtancoli, visiting with extended family from Bologna, Italy, stayed there two nights last week and described the rooms as clean and the front desk staff as courteous. But the bars on the first-floor windows were disconcerting, and because the price was high, he said, the family squeezed into one room with extra beds. Arun Upneja, dean of the Boston University School of Hospitality Administration, said rate fluctuation will continue as hotel chains become more sophisticated in their understanding of supply and demand in local markets and how it can affect profits. A convention, a baseball game, or a festival can alter pricing.